All webmasters want to protect their websites as much as possible. For example, enabling SSL certificate would encrypt the website and make it a safer environment. Unfortunately, SSL certificates cost money. Therefore, many websites on the internet are not fully secured. However, there is a project called Let’s Encrypt which provides authority SSL certificates free of charge. It is a great contribution to the safety of the internet. Today, we will learn how to install Let’s Encrypt SSL on a VPS Running Webmin/Virtualmin. Login to your Webmin/Virtualmin admin panel. You can usually do this by typing https://your-vps-ip-adress:10000 (replace your-vps-ip-address with the dedicated IP address of your VPS) into your browser. Choose Virtualmin between two options at the top of the left sidebar. 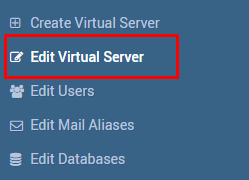 Choose the desired Virtual Server (you must have it set up already) from the drop down box at the top of left sidebar. Find and click Edit Virtual Server. Click Enabled Features. Feature list will appear. Make sure that SSL Website Enabled? option is ticked. 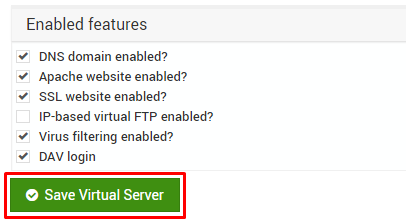 Make sure you selected the desired virtual server from the drop down list in the left sidebar. Find Server Configuration tab and open it. 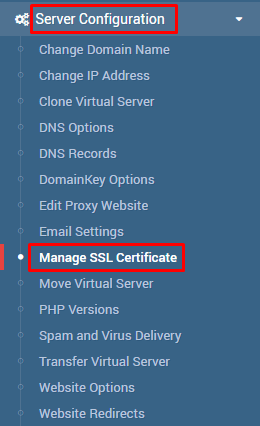 You will see many options, we need to select Manage SSL Certificate. A page with your current SSL details will open. At the navigation bar find and open Let’s Encrypt. In this step, you will need to check if default settings are correct and change them if they are not. Under section Request certificate for, you have two options to choose: Domains associated with this server and Domain names listed here. If you choose the first option, SSL certificate will be installed on your virtual hosts default domain names. 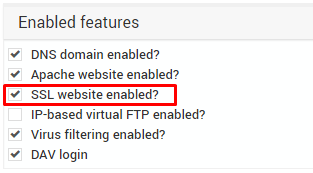 However, if you need to install SSL certificates on other domains/subdomains on the same virtual server, choose the 2nd option and fill in necessary domains manually. 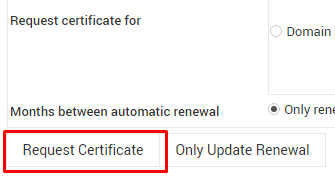 Under section Months between automatic renewal you have option Only renew manually or a field to fill in the period of months when the SSL certificate should be renewed automatically. Feel free to choose whichever option suits you best. Once you have everything set up as you need to click Request Certificate. If the certificate was installed successfully, you will get a success message! You should now be able to access your website using the HTTPS protocol. If you want to automatically redirect all of your website traffic to HTTPS version of your site, refer to how to force HTTPS tutorial. You have learned how to install Let’s Encrypt SSL on VPS running Webmin/Virtualmin. 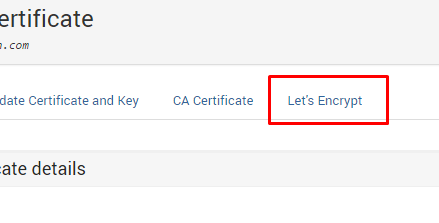 Let’s Encrypt is a great choice to encrypt your website with an SSL certificate. It will become a much safer environment for your users.